The diagram shows part of the curve . The point P(2,1) lies on the curve and the normal to the curve at P intersects the x-axis at A and the y-axis at B.
i. Show that B is the mid-point of AP. The shaded region is bounded by the curve, the y-axis and the line y = 1.
rotated through 360o about the y-axis. We are required to show that B is the mid-point of AP which is normal to the curve at point P(2,1). We need to find and compare the coordinates of point B and mid-point of AP. First we find coordinates of point B. 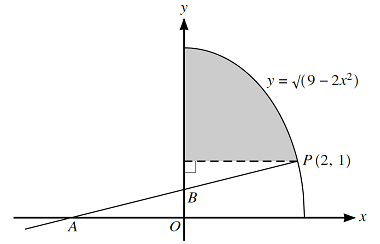 It is evident that point B is the y-intercept of the line AP. Therefore to find the coordinates of y- intercept of AP, we need to find equation of the line AP. It is evident that we have coordinates of a point on AP as P(2,1). Therefore, we only need to find slope of AP to write its equation. Therefore, if we have slope of the curve at point P(2,1) we can find slope of AP. Let’s find slope of the curve at point P(2,1). Now we can find slope of the curve at point P(2,1). Now we can find slope of AP. With coordinates of a point P(2,1) and slope in hand, we can write equation of AP. Now we can find the coordinates of point B which is y-intercept of AP. Hence coordinates of point B are . Now we need to find coordinates of mid-point of AP. To find the mid-point of a line we must have the coordinates of the end-points of the line. Therefore, we need coordinates of both point A and P to find the coordinates of mid-point of AP. We already have coordinates of point P(2,1). Let’s find coordinates of point A. It is evident from the diagram that point A is x-intercept of line AP. Hence, coordinates of point A are . Hence coordinates of mid-point of AP are . We have already shown that coordinates of point B are . Therefore, point B is the mid-point of AP. It is evident that to find the desired volume, first we need to write the equation in terms of y rather than x. We are given that the desired shaded region extends from line and y-intercept of the curve. Therefore, we need the coordinates of y-intercept of the curve.